Three 8 inch tortilla floutas deep fried and filled with bacon, grilled chicken and shredded cheese. Served over a bed of rice, lettuce and pico de gallo with a side of cheese dip and honey mustard sauce. 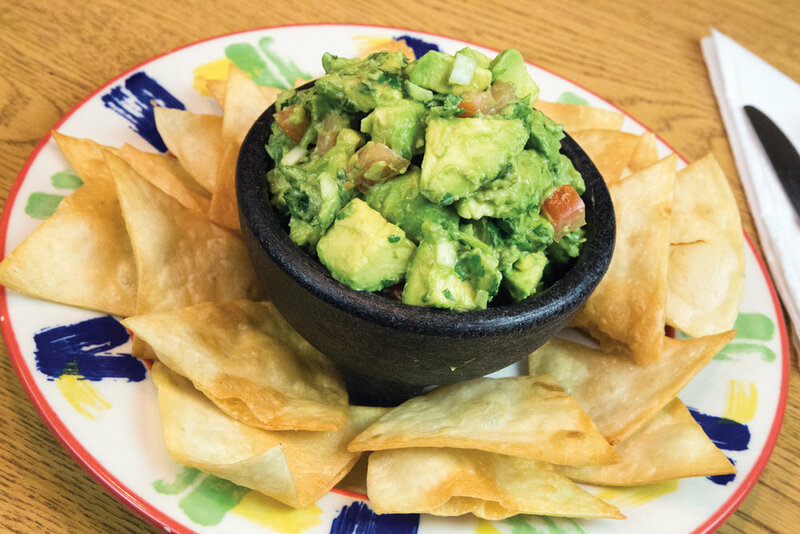 Chunky, fresh avocados cut in pieces and topped with pico de gallo. Served with golden flour tortilla chips. Chicken bits and Mexican rice set in a chicken broth, topped with pico de gallo and avocado slices. 8 large shrimp and vegetables set in our seasoned shrimp broth. A fresh salad with grilled chicken, mushrooms, shredded cheese and chopped tomatoes over a bed of fresh, crisp lettuce. Topped with your choice of salad dressing. Lettuce, guacamole dip and tomato. A large flour tortilla shell filled with chicken, lettuce, tomatoes, shredded cheese and sour cream. Chopped tomatoes, onions, cucumbers and mushrooms set in a bed of lettuce, topped with shredded cheese and your choice of salad dressing. A - 1 bean burrito, 1 cheese enchilada and 1 bean tostada. B - 1 chalupa, 1 cheese enchilada and refried beans. C - 1 bean burrito, 1 cheese quesadilla and 1 chalupa. D - 2 bean burritos with nacho cheese. E - 1 burrito and 1 enchilada filled with seasoned potatoes. Served with Mexican rice and refried beans. F - 2 quesadillas: 1 filled with mushrooms and 1 filled with spinach. Served with Mexican rice and refried beans. G - 2 vegetable tamales: filled with savory jalapeños, carrots, peas, squash, mushrooms, celery, spinach and beans. Served with Mexican rice and refried beans. 1 bean chalupa covered with lettuce, cheese, guacamole and sour cream. 1 bean chalupa with grilled bell peppers, onions, mushrooms, baby corn and tomatoes topped with lettuce, tomatoes, guacamole and sour cream. Grilled chicken, steak and shrimp over a bed of Mexican rice, topped with onions, bell peppers, broccoli, squash, zucchini, mushrooms and our signature cheese sauce. Grilled chicken strips over a bed of Mexican rice, topped with our signature cheese sauce and fresh made guacamole regional. 8 oz. chicken breast marinated overnight in our special Tequila marinade then grilled with red, green and yellow bell peppers and onions. Served over a bed of our dirty rice and black beans. 8 oz. grilled chicken breast. Served with Mexican rice, refried beans and guacamole salad. Grilled chicken breast strips over a macaroni bed, topped with broccoli and covered with our signature cheese sauce and a touch of Parmesan cheese. Grilled seasoned jerk chicken breast over a bed of pineapple and sour cream sauce. Served with white rice, black beans and grilled vegetables. Grilled chicken strips over a bed of Mexican rice, topped with our signature cheese sauce. 8 oz. grilled chicken breast topped with Mexican chorizo sausage and cheese dip served with Mexican rice and refried beans. 3 grilled chicken brochettes brushed with our sweet barbecue mango sauce. Served with 2 side options. 8 oz. grilled chicken breast topped with grilled onions, mushrooms, 2 pineapple slices and slices of melted American cheese. Served with Mexican rice, refried beans and guacamole salad. 8 oz. grilled chicken breast topped with grilled onions, tomatoes and bell peppers, over a bed of Mexican rice, topped with melted cheese. Grilled chicken strips topped with grilled onions, peppers, broccoli, and special sour cream sauce. Served with Mexican rice and refried beans. 8 oz. grilled seasoned chicken breast topped with our delicious queso sauce and homemade guacamole. Served with rice and beans. Refried beans, black beans, choribeans, Mexican rice, white rice, corn salad, grilled vegetables, french fries, macaroni & cheese, steamed vegetables and baked potato. Grilled seasoned jerk pork tenderloin over a bed of pineapple and sour cream sauce. Served with white rice, black beans and grilled vegetables. Pork tips with grilled onions. Served with Mexican rice, refried beans and guacamole salad. Choice of flour or corn tortillas. Tender pork tips served in our freshly made “salsa verde”. Served with Mexican rice, refried beans and fresh avocado slices. 8 oz. ribeye steak topped with grilled onions. Served with Mexican rice, refried beans and guacamole salad. Choice of flour or corn tortillas. 8 oz. flank steak covered with grilled onions and a fried jalapeño pepper. Served with Mexican rice, refried beans, and guacamole salad. Choice of flour or corn tortillas. Grilled beef tips mixed with sliced mushrooms, cooked in our fresh made Colorado mild sauce topped with shredded cheese. Served with Mexican rice and refried beans. Beef tips cooked with chile guajillo, onion, garlic and green tomatoes. Served with white rice, choribeans, (pinto beans, chorizo, jalapeños and cheese) and avocado slices. 8 oz. ribeye steak topped with our ranchera sauce. Served with Mexican rice and refried beans. Choice of flour or corn tortillas. 3 soft tacos (flour or corn tortilla) with bits of grilled steak. Served with refried beans, fresh tomatillo sauce and pico de gallo. 10 oz. T-bone steak topped with pico de gallo and 1 cheese enchilada. Served with refried beans. A combination of grilled onions, green peppers and tomatoes, served in a hot skillet in any style below. Served with Mexican rice, refried beans, guacamole salad, sour cream and your choice of corn or flour tortillas. 8 oz. of boneless, skinless chicken breast. 8 oz. of grilled steak. 8 oz. of large shrimp. Sweet red and yellow bell peppers, baby corn, mushrooms, onions and tomatoes. Your choice of chicken or beef slices over a bed of golden corn chips, topped with grilled onions and red and yellow bell peppers, covered in our delicious cheese sauce. Your choice of chicken or beef slices with grilled bell peppers, onions and tomato inside a 12-in. flour tortilla stuffed with cheese and topped with our cheese sauce. Served with Mexican rice and choice of refried beans or guacamole salad. 12-in. flour tortilla with chicken, steak and shrimp mixed with grilled onions, bell peppers and tomatoes topped with our cheese sauce. Served with Mexican rice and refried beans or guacamole salad. 12 grilled shrimp on vegetable skewers brushed with our honey chili glaze, placed over a 12-in. flour tortilla. Served with white rice and black beans. Jumbo shrimp with chopped avocado and pico de gallo. Served in our delicious cocktail sauce. 14 shrimp cooked in our special sauce, which is seasoned with onion, garlic, cilantro AND tomatoes over a bed of white rice and slices of avocado. Grilled shrimp with onions and bell peppers wrapped in a 12-in. tortilla topped with cheese dip. Served with Mexican rice and refried beans. 14 grilled shrimp covered in our spicy red sauce. Served with white rice and guacamole salad. Grilled shrimp over a bed of Mexican rice. Served with tartar sauce and a side salad. 14 grilled shrimp marinated in our mild garlic tomato sauce. Served with white rice, corn salad and avocado slices. 14 grilled shrimp sautéed with fresh garlic and onions. Served with white rice, corn salad, and avocado slices. Grilled tilapia fillet topped with our signature cheese sauce and 2 grilled shrimp. Served with 2 side options. Three tacos filled with grilled shrimp and coleslaw topped with chipotle sauce. Grilled shrimp over a bed of macaroni topped with broccoli, covered with our signature cheese sauce and topped with light Parmesan cheese. 14 Grilled Shrimp over a bed of Mexican rice, topped with our signature cheese sauce. Serves up to 4 people. Prepared with grilled chicken, grilled steak, 9 glazed shrimp on skewers and 6 bacon wrapped shrimp. Served with our special dip and grilled Tilapia fillet on a bed of rice. Choice of flour or corn tortillas. Serves up to 4 people. Prepared with grilled chicken, grilled steak, Mexican chorizo with grilled onions and pork over a bed of rice. Served with guacamole regional and our signature cheese dip. Choice of flour or corn tortillas. You get one of each: chile relleno, beef taco, beef enchilada, tamal and chalupa. Served with Mexican rice, refried beans and guacamole salad. 1 tamal, 2 taquitos (chicken or beef), cheese nachos topped with chicken, beef and refried beans, covered with lettuce, tomato, guacamole and sour cream. 4 oz. grilled chicken breast, 4 oz. flank steak bedded on a mix of chorizo (Mexican sausage) and grilled onions. Served with Mexican rice, refried beans, guacamole salad, pico de gallo and jalapeño peppers. Baked potato stuffed with grilled steak or chicken strips, topped with pico de gallo, avocado slices and our signature cheese sauce. Traditional Mexican dish. 2 poblano peppers filled with cheese, rolled in eggs and fried. Topped with our homemade special sauce. Served with Mexican rice and refried beans. Choice of corn or flour tortillas. Traditional Mexican dish. Lightly fried corn tortillas cut into quarters, topped with chicken cooked in our mild red sauce, covered in our signature cheese sauce and topped with shredded cheese. Served with Mexican rice and guacamole salad. 8-in crispy flour tortilla stuffed with cheese and your choice of beef or chicken. Served with Mexican rice and a choice of refried beans or guacamole salad. Chunks of beef or chicken wrapped in a fried flour tortilla and topped with cheese dip. Served with Mexican rice and a choice of refried beans or guacamole salad. 3 rolled fried corn tortillas stuffed with shredded beef or chicken. Served with Mexican rice and a choice of refried beans or guacamole salad. Cheese nachos with an assortment of ground beef, chicken and refried beans. Covered with shredded lettuce, tomatoes and sour cream. Grilled chicken or steak with Mexican rice and refried beans wrapped in a 12-in. flour tortilla, topped with cheese dip and pico de gallo. A flour tortilla stuffed with your choice of chicken, pork or ground beef, cooked with tomatoes, onions and bell peppers topped with cheese dip, lettuce, tomatoes and guacamole. Served with Mexican rice and refried beans. Grilled marinated chicken burrito stuffed with white rice and black beans, topped with freshly made adobo sauce and our cream based chipotle sauce. 2 burritos filled with refried beans and your choice of beef or chicken, topped with nacho cheese, burrito sauce, lettuce, tomatoes and sour cream. 8-in. flour tortilla stuffed with chicken or beef, topped with our burrito sauce, lettuce, tomatoes, sour cream and shredded cheese. A flour tortilla stuffed with grilled green pepper, onions, yellow squash, zucchini and spinach, topped with your choice of cheese dip or our regular burrito sauce, lettuce, tomatoes and guacamole. 5 Enchiladas: 1 each of chicken, beef, bean, cheese and shredded beef, covered in our fresh enchilada sauce and topped with lettuce, tomato, cheese and sour cream. Combination of 4 enchiladas: 1 each of chicken, beef, cheese and refried beans topped with our fresh enchilada sauce, shredded cheese, tomatoes, lettuce and sour cream. 3 chicken enchiladas topped with our special red sauce, lettuce, cheese and sour cream. 3 corn tortillas filled with chicken topped with our enchilada sauce, lettuce, chopped tomatoes and onions, sour cream and shredded cheese. 2 cheese enchiladas topped with your choice of beef, chicken or pork. 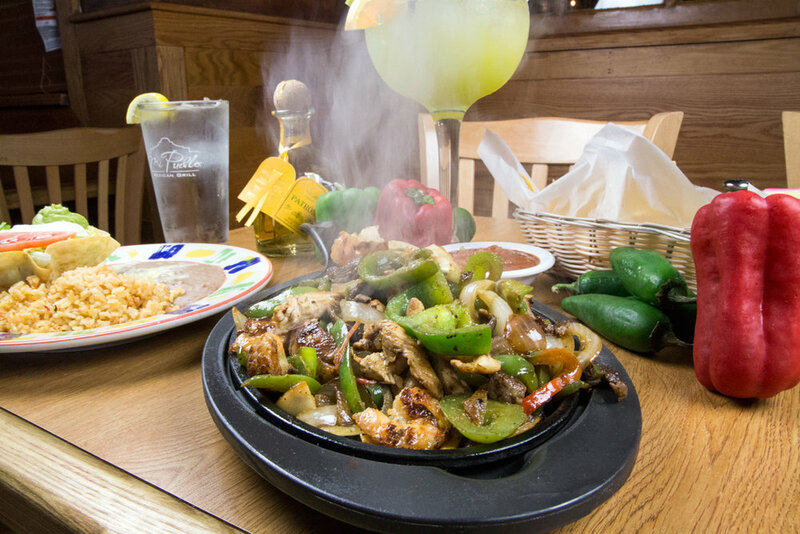 Served with your choice of Mexican rice and refried beans or guacamole salad. The chicken, ground beef, shredded beef and pork for our tacos, burritos and enchiladas are cooked with bell peppers, onions and tomatoes. Pick 2 Items with rice and beans, or choose 3 items with no sides. Please limit only 1 poblano, 1 chile relleno and 1tamal per order. Ground Beef, Shredded Chicken, Refried Beans, shredded beef, pork and cheese. *Denotes items that are raw or undercooked and contain (or may contain) raw or undercooked ingredients. Consuming raw or undercooked meats, poultry, seafood or eggs may increase your risk of food-borne illness, especially if you have certain medical conditions.